This is Luminescent Hybridwood, a stabilized burl wood block with a glow-in-the-dark twist. 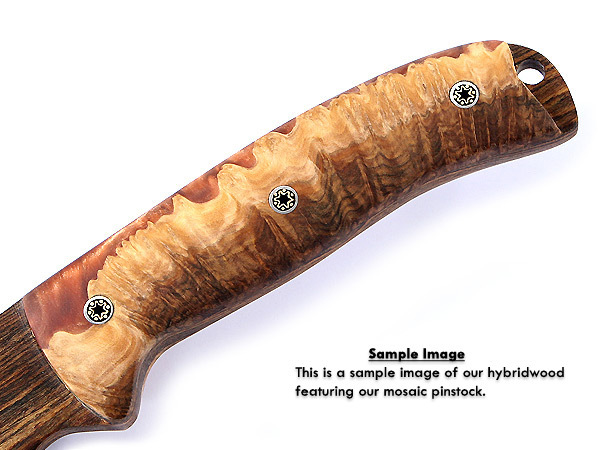 It has been dual stabilized with electric-blue colored glowing resin fill within the medium brown dyed burl wood. Each block is highly unique and exceptionally individual. If you're looking for the perfect handle material for your next exotic creation, try this material. It's highly figured, has plenty of contrast and will polish to an amazing finish. To activate the glow-in-the-dark feature simply expose it to a light source. This block size is perfect for custom knife or gun grips. You can easily yield two or more full-sized handle scale sets from this block.